The Social Identity Theory and the subsequent Self Categorization Theory seek to enable scientists to predict behaviors between groups of people. The Social Identity Theory, introduced by Henri Tajfel, is founded on the principles of Cognitive Psychology (CP). CP presumes that human behaviors follow the logically predictable consequences of interactions between mental processes. John Turner extended CP concepts with greater elaboration to propose a subsequent Self Categorization Theory to bring greater accuracy to the prediction process. The underlying assumption of CP is that orderly reasoning chains can explain and predict human behaviors. But the brain follows pattern recognition processes, which are far too complex to be linked through methodical reasoning chains. The mind is also significantly influenced by illogical emotional factors, which emerged from the evolutionary development of the brain. Cognitive psychology uses measurable computational logic to draw conclusions about the links between thought processes and behavior. The Intuition Theory developed by this website attributes pattern recognition to the conclusions of Social Identity and Self Categorization Theories. The Social Comparison Drive explains social behavior better than the Social Identity Theory. Intuition Theory suggests that innumerable factors other than the need to be distinctive in a group determine behavior. The reward mechanism, which motivates people is described. Reward oriented behavior is more rational, while the infliction of punishment is induced by the anger emotion. Social Identity Theory suggests that similar groups try to differentiate themselves. In an infinitely variable pattern recognition process, the Self Categorization Theory attempts to define a step by step process to identify the "Self." 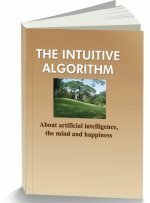 Intuition uses an elimination process to identify trillions of patterns. The Self Categorization Theory suggests that group memberships decide behaviors. The Intuition Theory suggests that emotions decide behavior. Cognitive Psychology, as first defined by Ulric Neisser, draws parallels between human thought and computational functionality. CP endeavors to draw conclusions from the logical links between thought processes and behavior in processes by which the sensory inputs are transformed, reduced, elaborated, stored, recovered, and used. CP supports its theories using the measurable modules of computational logic. But, human behavior is defined by such unmeasurable differences as those between charm and dignity or contempt and enmity. Measurable aspects can only yield vague representations, or predictions, of the immense variations possible for human behavior. 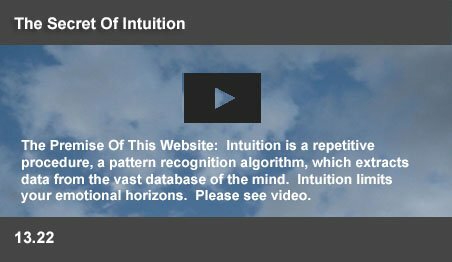 The Intuition Theory (IT) developed in this website suggests that there are too many variations possible in human behavior. The mind uses microscopically differentiated pattern recognition to respond with precision to an immense range of unpredictable emotions. Inherited and acquired combinatorial memories assembled by evolutionary development have precipitated a myriad of irrationalities into a massive emotionally managed system. The behaviors triggered by emotions are far too subtle to be covered by the measurable modules of computational logic. IT can explain the emotional aspects of evolutionary development which support the experimental findings of the Social Identity and the Self Categorization Theories. But those findings cannot form a basis for predicting human behavior in real life situations. The Social Identity Theory proposes that an individual has an internal concept of being a member of a social group; that this inner perception of having a particular social identity influences his/her behavior towards other perceived social groups. The theory suggests that it is possible to predict such behavior on the basis of how society views differences in status, legitimacy and stability of those status differences and the potential for mobility between groups. IT suggests that such social identification follows a primary survival need, when grazing animals grouped together to protect themselves. Their behavior as groups and as individuals within groups follows the logic of herd harmony and survival. The groups moved and acted together, without any overall plan. Unlike an army detachment, which follows a top down plan, individual emotional controls achieved beneficial group behavior in herds. An ongoing internal Social Comparison drive, proposed by social psychologist Leon Festinger, helped herds to imitate the behavior of equals to choose cooperative patterns of behavior. These tendencies create a status structure of higher and lower groups. A dominance hierarchy is established, with leaders and followers. Each group compare themselves within their own group. At the watering hole, the leader drinks first. Others instinctively follow. These are instinctive survival behaviors not based on a perception of the self as a social category, but based on drives of comparison, fear, or empathy. The Social Identity Theory suggests that individuals are rationally motivated to become positively distinctive in their group. They also strive to achieve a positive social identity. Where group boundaries are considered stable and impermeable, individuals are predicted to engage in social creativity behaviors. Group members act to increase their positive distinctiveness without damaging the group resources. The “black is beautiful” movement embraced African hairdos, culture, traditions, and music to creatively improve the prestige of their own social group. The Intuition Theory suggests that the drive to become positively distinct follows inner emotional drives. The Social Comparison drive causes individuals to evaluate their own opinions and desires by comparing themselves to others. People look at outside images to evaluate their own views and abilities. These images are sought to be realistic and achievable. The drive to compare reduces as the comparison image diverges from their images of their own views and abilities. People tend to move into groups of similar opinions and abilities, and they move out of groups that fail to satisfy their comparison drive. While the theory supports the findings of the Social Identity Theory, the drive for positive distinctiveness is the result of the operation of a reward mechanism rather than that of a rationally directed objective. Becoming distinctive in one's peer group is a rewarding objective. Professor Wolfram Schultz discovered that reward oriented behavior is promoted by the release of a group of neurotransmitters by neurons in the early reptilian (approach or withdraw) part of the human brain. When these neurons detect signals of the possibility of a reward within a specific time frame, they release dopamine in the forebrain. Increased dopamine intensifies forebrain activity, bringing clarity to objectives, making the mind feel more energetic and elated. The Social Identity Theory gives importance to the tendency for positive distinctiveness. The theory suggests that punishment of other groups for benefits is less rewarding than granting benefits to the members of their own groups. Reward oriented behavior heightens prefrontal activity and inhibits the amygdala, the region, which triggers anger and fear. People, who are motivated to become distinctive are less likely to punish others and will consider rewards to be more rationally acceptable. The rational decisions covered by Cognitive Psychology become more feasible, when negative amygdala activity becomes stilled. A need to punish others may derive from anger over a sense of unfairness over one's own fate. Social identity theory suggests that similar groups should have an increased motivation to differentiate themselves from each other. But research has revealed that similar groups are attracted to each other and are less prone to differentiate between each other. The theory justifies this finding, since groups seek greater stability and legitimacy in the structure of groups. This attraction may also follow from the sense of security granted by a similar group in a hostile world. Territorial instincts have evolved over millions of years to make a person sensitive to the protection of his territory. The early reptilian part of the brain acts to protect territory. At the lowest level, the hypothalamus responds to territorial threats. A patient with severe brain damage, with the hypothalamus intact, was reported to growl or exhibit distress, when approached. Invisible instincts warn people, when their interests are threatened. The enthusiasm for football is not threatened by other groups of football fans. Such groups will seek greater stability and legitimacy in the structure of their organizations. The research findings of the Social Identity Theory support this tendency. Football fans also clash, when they feel that their heroes are threatened. The Self Categorization Theory provides an analysis of the individual and group categorization process where people perceive themselves to be members of a group through social perception and interaction, and consequently modify their behaviors. The theory suggests that the self is not the “thing” at the heart of cognition, but is rather a product of cognition - the process by which sensory inputs are transformed, reduced, elaborated, stored, recovered, and used. The Intuition Theory suggests that the “self” is a discovery of the association regions of the brain, which follow a holistic multistage pattern recognition process. As an example, the somesthetic area of the brain receives touch sensory impulses. If this area is damaged, a patient cannot feel touch sensations. If this region is intact and there is damage to the somesthetic association region, a patient is unable to identify a pair of scissors held in the hand while his eyes are closed. He can feel the scissors, but cannot recognize it as an object. Recognition by touch is a specific ability of the brain. Failure of each association region causes the failure of a particular recognition ability. Recognition abilities for numerous senses occur at a myriad of levels in the brain. Ultimately, the self, the other person and groups of people are individually recognized by the brain with an infinity of subtle variations. As an example, failure of the insular cortex can lead a patient to believe that a portion of his own body is not a part of his “self.” Pattern recognition by the brain is a global process, not a stage by stage mechanism. Microscopically small factors in the system can trigger global changes in recognition. The Self Categorization Theory attempts to define stage by stage (step by step) “cognitive levels of abstraction” which finally lead to a recognition of the self and the group. The Intuition Theory suggests that the mind recognizes instantly through a global perception of the environment. Neural pattern recognition is able to finely identify an infinity of microscopically fine variations between perceived objects and events. The Self Categorization Theory attempts to bracket such subdivisions into measurable categories. The theory defines three levels of abstraction as an example. The lowest level of abstraction is given as a personal self, where the perceiver self categorizes as “I”. A higher level of abstraction corresponds to a social self, where the perceiver self categorizes as “we” in comparison to a salient outgroup (them). A highest level of abstraction is represented by we humans, where the salient outgroup is animals or other non-humans. The fault of the theory lies in its efforts to provide “reasoning chains” through definable links in the recognition process, ignoring the capacity of the mind to think within a continuum in countless directions. Tajfel and Wilkes discovered that the presence of a categorization scheme for line lengths caused participants to view lines belonging to different categories as being more different than when the lines were viewed without such a categorization scheme. The accentuation component of self-categorization theory stems from this research on non-social accentuation. Assuming that an efficient cognitive system would use the same systems regardless of the social or non-social nature of the stimuli, self-categorization theorists have demonstrated that a perceiver would describe another person as more or less similar to themselves as a function of the likely categorization scheme. The theory suggests that there are logical links between a categorization theme and the recognized result. The mind arrives at a conclusion through a process of elimination – through inhibition of unlikely possibilities in the immediate emotional context. An emotional context will instantly eliminate his membership of numerous categories, which he occupies - racial, social, sexual, or career based to arrive at a category, which despises his opponent, or admires his colleague. The mind is not an “efficient cognitive system,” but an intuitive pattern recognition system, where dominant emotions decide categories of thought. The theory defines the current social category a “salient social category,” or a “salient social identity” and suggests that the readiness of the perceiver will decide on his level of identification to a category. Such readiness depends on a person’s past experiences, present expectations, and current motives, values, goals and needs. The theory suggests that a higher valuation of a category will trigger identification with it. Self Categorization theory uses the meta-contrast principle, defined as the ratio of the average similarity of the individual to outgroup members over the average similarity of the individual to ingroup members. As the comparative context extends, people tend to self-categorize at more inclusive levels. Amy and Beth will select different categories, when they compare themselves, but will select the same category, when they compare themselves with men. Comparative fit is one of the contexts for identification. A normative fit is the extent that the perceived behavior or attributes of an individual or collection of individuals conforms to the perceiver’s norms. A group may be categorized as science students if they are perceived as hardworking. The Intuition Theory suggests that emotions set the context for human behavior. Anger, fear, compassion, guilt, respect, pride, trust and contempt are emotions, which set the current context for behavior. When a person faces an obstruction, his anger places his opponent in an unfavorable category. When he feels fear for another, he places him in a category, which represents over whelming power. When he regrets an action he has taken, he places the other in a favorable category, which deserves help. When he perceives a courageous action, his pride makes him identify with the courageous individual's category. Each category will support a particular type of behavior. The Self Identity Theory and The Self Categorization Theory do not appear to have given sufficient importance to the role of emotions. But, then reasoning chains used in Cognitive Psychology may have trouble with the irrational links created by emotions. This page was last updated on 12-Nov-2018.